On Thursday, 10 April 2014, Erongo RED reached another milestone by launching the Call Centre as part of company’s drive to become a customer focused and enhance communication with customers. The new call centre is first of its kind in the electricity supply industry in Namibia. According to Kahimise, “the Call Centre software is designed in such a way that it is able to keep track of the calls received each day and how many of these calls have been resolved. The Call Centre will receive customer complaints through several channels such as telephone, fax, email, etc. The customer complaints are registered and resolved immediately or forwarded to the field personnel for timely action and rectification. The status of the complaints are periodically tracked and updated and the customers can know the status of the complaints logged and registered by contacting the call centre personnel. In case the complaint is not resolved within a specified time limit, the complaint is escalated to higher authorities for expediting the resolution thereof,” Kahimise said. Customers of Erongo RED will now be empowered to have information they need within regulatory accepted standards. The call center will also serve as a central hub that links a customer and our organisation together. 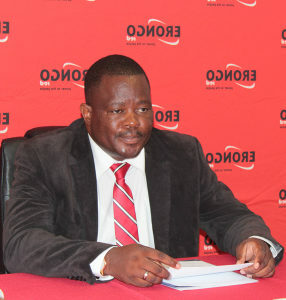 Erongo RED has recently commenced with the SMS platform, which enables the company to send Bulk Power Outage Notifications via a cellphone to all the customers that have registered with us. Customers who would like receive SMS notifications are encouraged to please update their account information by visiting our customer care offices. We would like to hear from you! If you would like to send us your feedback, suggestions or queries, click here for our contact details.